You are invited to a special Fundraiser Luncheon at Jasons’ Restaurant. Your participation will help us raise much needed funds for our centre. TRANSPORT: if you require a lift to the lunch, please let a JPC staff member know and we will try to assist. 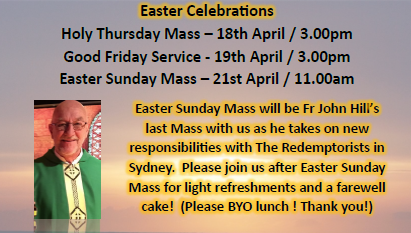 Please join us after Easter Sunday Mass for a farewell celebration for Fr John Hill.